For more than 30 years, Giamberardino Dental Care has been the preferred family dentist in Medford—and for good reason! We strive for dental excellence while we treat your family as our own. 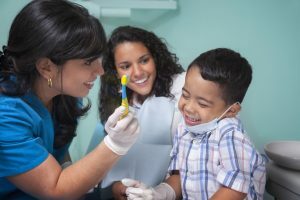 When it comes to choosing a dentist, you need a dentist who caters to the needs of each person in your family while making everyone feel comfortable. In addition, you need a dentist who offers all of the services your family needs under one roof. At Giamberardino Dental Care, we offer all of this and much more. We raise the bar for dental excellence, which is why families in the area love Dr. Giamberardino and his friendly staff. Dr. Giamberardino graduated Harvard College with a Bachelor of Arts degree in 1980. He continued his education to receive is Doctorate of Dental Medicine from Tufts University School of Dental Medicine in 1985. Throughout his career as a dental professional, he has had the opportunity to provide treatment and coordination with Harvard Community Health Plan prior to opening his practice in Medford in 1993. Over the years, Dr. Giamberardino has had the privilege of working with many families in the area to provide exceptional dental services. Over the years, families have turned to him first for complete oral care. Supported by his academic and professional accomplishments, he provides high-quality preventive, restorative, and cosmetic services. As a result, he is able to cater to the unique needs of each person in your family, even as those needs change over the years. His dental team welcomes each and every patient into the office with open arms, treating each patient like family. Together, they provide the caring, comfortable, and family-friendly atmosphere your family deserves. We will not just treat you like another patient. We get to know you and your family to deliver personalized care. In addition to exceptional dental services, we also offer state-of-the-art advancements to enhance patient comfort while delivering high-quality care. Our office features many technological advancements, including digital x-rays to ensure our patients experience a higher level of comfort than what is found at other dental offices. In addition, the digital x-rays provide us with clearer images to better diagnose and treat oral health needs. We also offer the best dental advancements, including all-ceramic restorations, dental implants, and porcelain veneers to ensure your smile stays beautiful. We use high-quality materials and up-to-date dental practices to ensure you receive the highest level of care for flawless results. At Giamberardino Dental Care, we strive to make each patient feel like family, which is exactly why local families have come to love our dental office. Year after year, we care for families, watching families grow as our own. We will provide the exact care your family needs over the years—from the time the first tooth erupts to the time your children start their own family. If you are in need of a family dentist who truly cares, choose Giamberardino Dental Care. Contact our office today to schedule an appointment.